Saudi Arabian crane rental company Arabian Consolidated Trading (ACT Crane & Heavy Equipment) is expanding its fleet with an order for four Demag AC 160-5, two AC 300-6 all-terrain cranes and four Terex RT 90 rough-terrain cranes. The new units help support ACT customers around its locations Jubail Industrial City and Yanbu Al-Bahr. “We are proud to serve the team at ACT Crane & Heavy Equipment,” said Deepak Jain, senior sales manager for Terex Cranes in the Middle East. ACT Crane & Heavy Equipment’s new five-axle Demag AC 160-5 all-terrain cranes have a 160-tonne (180 US ton) lifting capacity and a maximum system length of 95 m. They are the most compact cranes in their capacity class with a total length of 14 m and a carrier width of 2.75 m and deliver excellent manoeuvrability with all-axle steering, independent rear axle steering, and dynamic launch control. The six-axle Demag AC 300-6 all-terrain crane, boasting a 300-tonne classification, features an 80-m main boom. 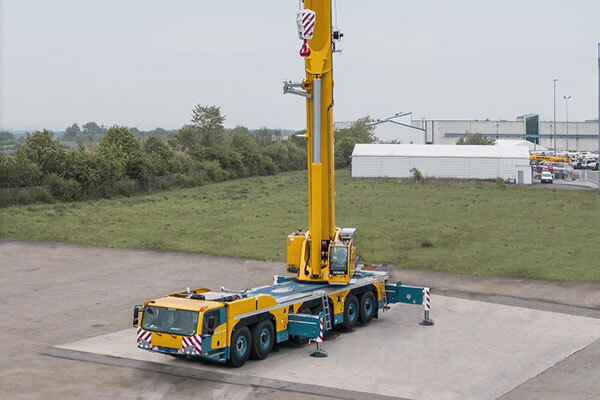 This new Demag crane delivers strength, reach and versatility needed for accomplishing the most demanding jobs at lower operational and transporting costs than similar models in its class. The Terex RT 90 rough-terrain cranes have an 86-tonne rated capacity, a maximum boom length of 47 m and a tip height of 50 m. IC-1 controls provide easy operation, smooth control and integrated diagnostics while the removable counterweight will let ACT move quickly and efficiently from job to job.